What speed should you use with Panaerobics – whether HeavyHands, Longstrength, or IsoTonoMetrics? The books of Dr. Schwartz are helpful in this regard – to a point. He describes working at various rates – all which seem rather fast paced. It could even seem like this suggested speed of motion could not be done while maintaining strict control of the handweights. Dr. Schwartz would have argued against using the weights without full control. It’s worth noting that the highest speeds were done using weights in the one to three pound range, not the heavier weights normally shown when Dr. Schwartz posed for exercise pictures… some estimate them as about 8 pounds. His videos – both of “HeavyHands” and “Wholebody Fitness for Seniors” may give a better feel for the range of speeds at which Panaerobics might be pursued. In those videos as arm motions are counted, the number of repetitions is about 1 per second and, of course, a whole body motion is involved, not just arm motions. Of course, Dr. Schwartz spoke about “slowaerobics”… movements as few as 10 per minute which could be included in a routine as part of a strength building phase within the larger workout. Exercise fans coming to Panaerobics from a background of weight training, calisthenics, or “dynamic tension” who see the “120 reps per minute” as strange or unrealistic based on their past experience may unconsciously find themselves gravitating towards slower movements that may not be able to produce the desired cardio response. 1) Never use a weight that cannot be fully controlled… when in doubt reduce the weight. 3) If at all possible, workout to one of Dr. Schwartz’ exercise videos and attempt to mirror his pace and actions if it can be done comfortably. All three suggestions can be helpful, but perhaps the last one is best. By modeling Dr. Schwartz directly, ideas about proper pace are perhaps most easily answered. 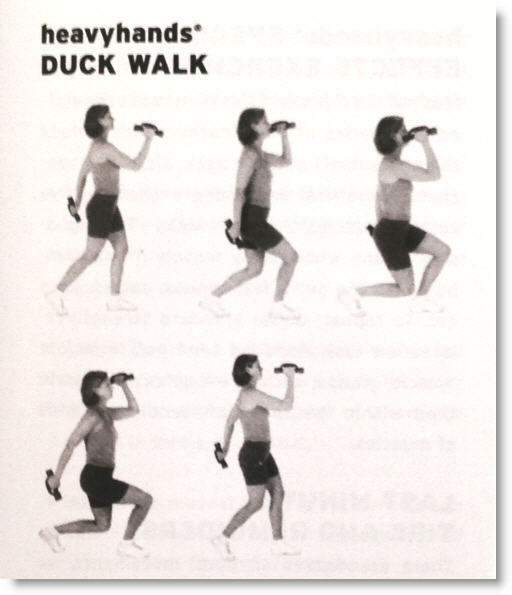 Pace learned through one form of Panaerobics will likely carry over well to other forms of exercise advocated by Dr. S.